Identifying fire ants is difficult because they look much like ordinary ants. They're 1/8" — 1/4" long and reddish brown to black in color, and are probably best distinguished by their aggressive behavior and characteristic mound-shaped nests. The nests each contain several hundred-thousand ants, and can reach densities of up to 1,000 nests per acre. Generally, mounds are 12" or more in diameter and height, although, mounds in excess of two feet in diameter and height are not uncommon in Georgia. The underground portion is a series of interlocking galleries, tunnels and chambers that may extend to depths of one to five feet or more, depending on soil type, age and colony size. Tunnels just below the soil surface extend laterally several yards out from the mound, with regular exits where the ants come out to search for food or attack. When disturbed, fire ants are very aggressive. The ant grips the skin with its mandibles (jaws) and stings its victim several times in a circular pattern around the point of mandible attachment. Because of the ant's aggressive nature and capacity for multiple stings, an attack usually results in several stings. Some people who are stung experience only local reaction and temporary discomfort but, in most, a swollen red area will occur followed by a sterile pustule within 24 hours. Although the venom is bactericidal, secondary infections due to scratching may occur. Although a single fire ant sting hurts less than a bee or wasp sting, the effect of multiple stings is impressive. Multiple stings are common, not only because hundreds of ants may have attacked, but because individual ants can administer several stings. Wear rubber boots and gloves powered with talc. Tape the cuffs of your pants and long-sleeved shirt. Fire ants will first bite with their mandibles in order to anchor for the thrust of the sting. As soon as you feel this pinching sensation, quickly sweep the ants off before they actually sting. The June 2003 issue of Field & Stream reported that the mouthwash, Listerine, applied to fire ant stings will alleviate the pain and prevent the pustules from forming. While I have not tested this myself, nor heard of this treatment elsewhere, it may be worth a try. Late August through early October is an ideal time to apply fire ant bait to your lawn — ants are still foraging and weather patterns are more predictable so you can apply bait when no rain is expected for several days after treatment. Baits are slow-acting, taking weeks to months to reduce ant mound numbers. It's a lot easier to be patient with baits while holed up inside during the winter than in the spring, when you're anxious to get outdoors — without getting stung. Use the right gear in the right way so you and the environment don't get hurt. Be careful and only use insecticides when and where they are needed. Closely follow label directions. Today's baits are gentle on the environment and are best applied using crank-type seeders or spreaders. The 2-Step Method (using baits and treating recurring mounds individually) is best for most heavily infested turfgrass areas. 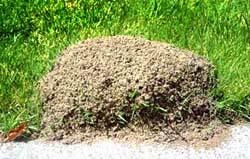 In areas with low fire ant populations or an interest in preserving native ant species, treat mounds individually.